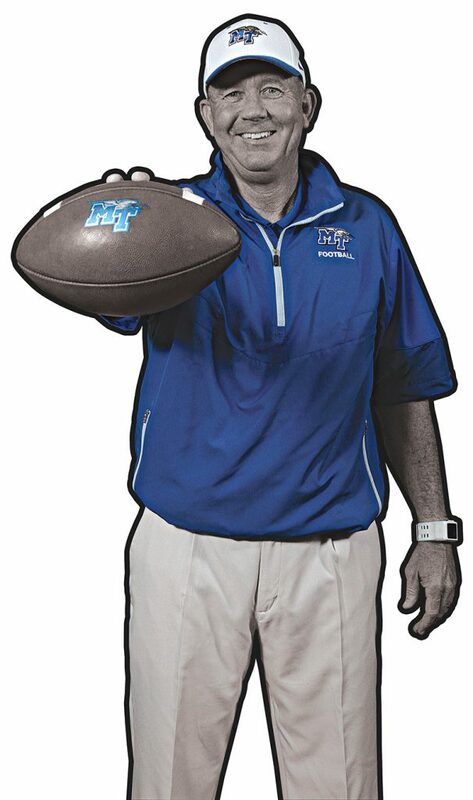 MTSU head football coach Rick Stockstill, ‌called “Coach Stock” by some, is known for many things. He’s known for being the first quarterback to play for legendary coach Bobby Bowden when Bowden began to build his dynasty at Florida State in the 1980s. He’s known for taking one of the nation’s lowest APRs (the NCAA’s measurement of academic progress among student-athletes) and elevating it to one of the best in the nation—right alongside the Vanderbilts and Stanfords of the country—during his coaching tenure at MTSU. 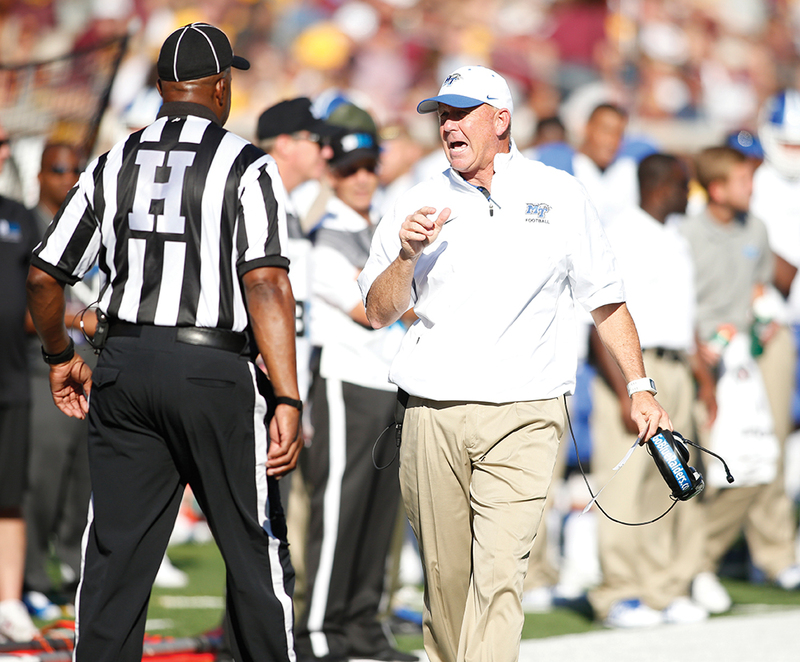 He’s known for leading the Blue Raider football program to six bowl games in the past nine years, including the Bahamas Bowl this past December. And, behind the scenes, he is known for how effectively he recruits and develops young people. Jubenville, an author, Washington Times columnist, and motivational speaker, knows about this perspective firsthand; he helped to form Stockstill’s process into a written pitch that goes out to recruits and their families. 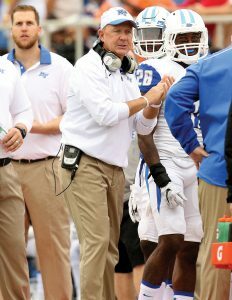 On the eve of a new football season, MTSU Magazine hopes these words straight from the coaches mouth on the next page fire up the MTSU faithful about the program, the man leading it, and the student-athletes committed to making our team great this year. Young people want to know three things. Who is in charge? What are the standards? And how am I going to be held accountable? I believe developing people starts with standards. Standards create buy-in. Buy-in defines chemistry. The development of your son though our program over these next four years will shape who he will be for the next 40 years and beyond. My first responsibility is to provide a set of standards that will help your son understand that if he wants more, he has to become more. I believe that if you show me your friends, I will show you your future. The reality is we are all making choices and that with each choice comes a new set of opportunities and consequences. I want your son to learn not only how to make choices, but more importantly, what choices to make. Problems in this country resulting from guns, drugs, and alcohol are real, and it’s clear that people make poor choices when they are under the influence of any of these vices. I give our team examples of athletes that lost everything because of a poor choice, as well as examples of athletes that have won everything because they knew what decisions to make. I believe we have to be better tomorrow than we are today, whether it is in the weight room, film room, classroom, practice field, study hall, or a career. The only way to get better at anything is to give greater effort and be intentional about the future you want to create. There is no substitute for hard work. There are no shortcuts to the top. The only way I know to get better is to have a never-give-up attitude and a relentless work ethic. Winning in All That You Do Matters. I believe winning off the field leads to winning on it. That means we have to win academically by going to class, study hall, and, ultimately, graduating and transitioning into a professional career. We have to win by being a great example in the community with the choices we make. We have to win by being a great teammate, and by respecting and being accountable to each other. Once we do this, then winning on the field becomes easy. We win because we do things the right way both on and off the field. You can accomplish all of your goals both on and off the field while being part of our program. I challenge our players to set high but attainable goals. Our team has a 96-percent graduation rate. With six bowl game appearances in nine years, we are also winning on the field. We have more than 10 players on NFL rosters. We are on television more than any other school in our conference. Why? Because we set and achieve worthy goals each and every season. Finally, I want to coach and have people in our program that understand that all of this matters! They are people of high character and integrity who embrace struggle and are willing to give back. They strive to be the best that they can be, and they know how to use adversity to accelerate their growth. They represent themselves and their families in a positive way. And they do it because they understand it matters. This isn’t for everyone, and we understand that. It is for people that choose to be a part of our team, a part of our future, and a part of the legacy we want to leave behind. It matters to them, and it matters to us.